In today’s super-competitive job market, you need to do extensive research beforehand to get a leg up on other applicants. 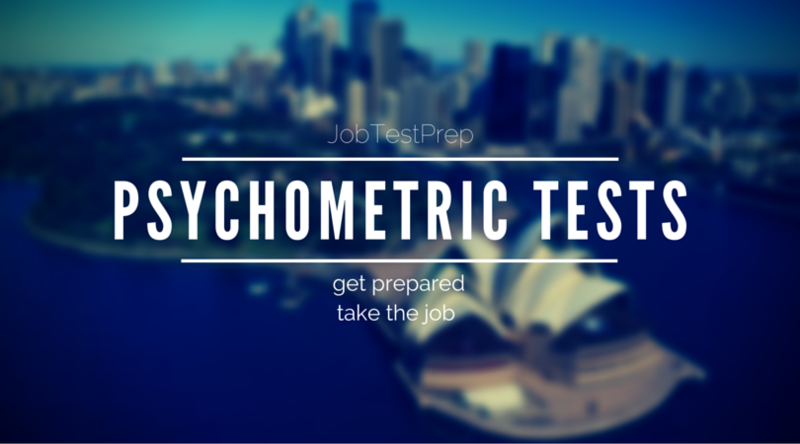 One area that requires careful preparation is psychometric testing, which has become standard for jobs across all industries. For most applicants, psychometric tests are intimidating; fortunately, with the correct preparation there is nothing to be scared of. One company named JobTestPrep has made it its mission to help prepare graduates for the tests they will face during the application process. Today we will sit down with JobTestPrep and find out what services they have to offer you, and why you should take full advantage of these services. Q: Thank you for sitting down with us today, I appreciate you taking your time to do this interview. Firstly, could you please tell me a bit of background about JobTestPrep and the services that you offer? A: JobTestPrep is all about helping people to prepare for tests. Whether it’s job applications, army tests, the police force, university admissions tests or anything else. Since 1992 we’ve been helping job seekers and future students achieve their goals by using our practice resources. We’re proud to say that we’re currently the UK and Europe’s biggest provider of online practice resources for psychometric and job selection tests. When I say ‘biggest’, I don’t just mean in terms of customers, but also in terms of the amount of practice resources that we have available for our users. We’re also the only company on the market that offers users practice packs that are tailored to specific job applications. So, rather than just offering generic numerical or verbal practice, we can tailor a practice pack to match the requirements of somebody applying for a specific position in a specific company. Q: Thank you for that comprehensive overview. When it comes to testing, how does JobTestPrep design practice tests that are similar to the official tests from different test providers? A: We have a dedicated test development team that studies the tests used in job applications and simulates these tests as accurately as possible to create our practice packs, in order to give users a practice experience that is as realistic as possible, without being carbon copies of the actual tests. Q: Just to clarify your answer; are the real tests very similar to those JobTestPrep practice ones? Access JobTestPrep‘s wide range of psychometric test practice here. Q: I have two questions in one for you. In Australia, SHL and Revelian are the most popular test providers, which one is more difficult than another? If one practises one style of test well, can they do well in the other one without any problem? A: I’ll answer your second question first, if that’s alright, because we get that question a lot. At the end of the day, any practice is better than not practising at all. So from that point of view, somebody who spends time practising for SHL tests but actually takes a Revelian test is still better off than somebody who does no practice at all. However, the bottom line is, the tests are different. Q: That makes a lot of sense. There are more Australian employers use gamification-based assessments in their recruitment process, does JobTestPrep offer practice tests for these? A: The gamification of psychometric tests is a developing, and still pretty small aspect of the testing process that most job applicants won’t come across. For that reason, for the meantime, we’re focused on producing more traditional practice packs for our users – which are more likely to be helpful to the majority of people. Bear in mind also, that the gamified tests don’t cover a wide range of assessment topics; meaning that if you’re applying for a numbers-based job, you’re going to have to pass a numerical test – which won’t be gamified (at least, not yet!). Q: As we wrap up, what’s your general advice for our students who want to perform well in their recruitment tests? A: Practice makes perfect! Many of the psychometric tests used in recruitment processes touch on similar themes, and once you’ve spent some time practising you’ll start to notice the same types of questions coming up over and over again. The other thing to note is that many people struggle with the tests because of the time pressure involved. If you’ve drilled tests which accurately simulate the real thing under time pressure – before beginning your actual test – you’re likely to find the whole experience much less stressful. The format, wording, style and content of the test won’t come as any surprise. Once you’ve been informed by a prospective employer that you’ll need to take psychometric tests, try to find out as much information as possible about the tests. This means the test provider, the topics that you’ll be tested on and any other information you can get. Don’t feel uncomfortable requesting this information – if you’ve been told that you’ll be tested then it’s perfectly fair to ask what you’ll be tested on. In fact, it’s probably expected (for this reason many companies now publicly state on their websites exactly what their psychometric testing processes are). Q: Thank you again for taking time to sit with us and give us a comprehensive outlook on psychometric testing in the job market. I am certain that thousands of graduates will pick up a lot of tips from this interview. A: You’re welcome, and thank you for having me here today. As you can see, JobTestPrep has a lot to offer graduate students who are looking for positive results in the job market. I would advise you to apply the tips given above to your application process, so that you can witness a boost in your job search efforts. I wish you the best during your journey. If you have any questions about psychometric testing in general or any specific questions for JobTestPrep, please leave your comments below and we will have your questions answered. Access JobTestPrep’s wide range of psychometric test practice here. These are very practical sample questions. My wife and I have just simulated this interview and we end up eating Nutella haha. This makes me more optimistic and 100% ready for the real interview next week. To everyone out there who is still hunting for a job, I wish you every luck and success in your job search. At first I didn’t know this blog has a tremendous database on the psychometric testing, my wife forced me to check for it and I am happy to have her as my soulmate. do you have any pratice test else ? i just wanna prepare carefully before giong on the interview. Can you show me some more tips and guidelines to the test ? The ansers may vary among individuals but you’ve got to keep your self-esteem as it shows who and what you are. The practise is somewhat reliable but I don’t trust this one. I don’t know, I’m not judging anybody, so don’t blame me this time. there’s a link in the post and I click it just right the time I see it. Some tests are more professional than this but in general it’s just a practice test so don’t be over-confident and underrate any possibilities.